This concrete cigarette receptacle features a removable aluminum funnel top which ensures that cigarette butts make it into the bowl for proper disposal and keeps them contained and out of sight. Steel reinforced construction for maximum durability and minimum maintenance. 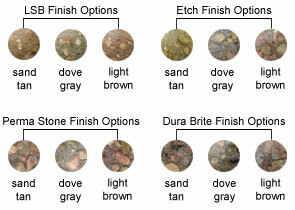 Treated with water-repellent sealer to enhance the appearance of the stones, help prevent water, salt or dirt penetration and cracking, and most importantly, extend the life of the aggregate by forming a protective barrier against the elements. Includes Spun Aluminum Funnel Top and Bottom Bowl. 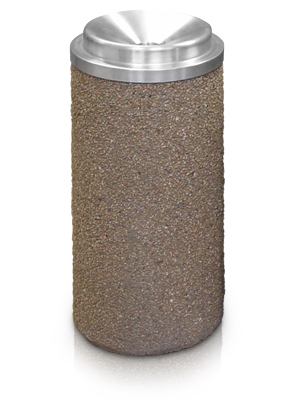 This precast concrete cigarette receptacle is available in Light Sand Blast, Etch, Perma Stone, and Dura Brite finish options. Manufactured from high quality aggregates to ensure all requirements are met according to ASTM standards.